As you all know, today’s fast paced world can be very stressful. It pulls us in a million and one directions, and we’re always rushing to meet an unending string of deadlines and the expectations placed on us by our employers, friends and even our families. I know that it can often be hard not to get anxious or stressed. As if it wasn’t bad enough that all that pressure is zero fun, on top of that, chronic stress negatively impacts our overall health. It can lead to sleep problems, depression, anxiety, chest pain, high blood pressure, burnout, the inability to enjoy life, etc. That is why it is important to minimize stress whenever possible. Because we’re all striving for a contented life, where we’re happy, healthy and free of chronic stress, aren’t we? So, what should you do if your days are consistently stressful? Well, the first thing you need to do is learn to manage your stress. One excellent way to do that is through meditation. 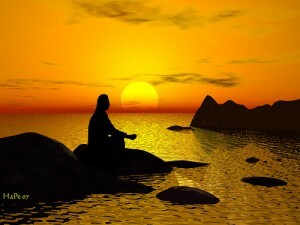 Meditation helps to dissipate tension and bring a sense of calm and inner peace. Since meditation is such a useful tool for managing stress, I am dedicating this show to the practice of Meditation. I’ll cover what meditation is, its benefits and some tips on how you can start meditating on your own. Some references I used while researching this show are The New Wellness Encyclopedia and Mayo Clinic.